Chiropractor in Lake Hallie, WI 54729 Reilly Chiropractic | (715) 723-2892 – Pain or No Pain you'll feel better! Chiropractic Offices in Chippewa Falls and Lake Hallie are all different – What can Chiropractors and Chiropractic Treatment Do For You? Welcome to Reilly Chiropractic. Our Chippewa Falls/Lake Hallie chiropractic office is located at 4751 W. Park Ave., in beautiful Chippewa Falls, WI 54729, in the heart of the Chippewa Valley between Chippewa Falls and Eau Claire. There’s nothing we want more than to be able to contribute to your health and well-being. Are you living in pain? Are you searching for Chiropractors? Call us today at (715)-723-2892 to set up your free consultation. Find out how chiropractic care can help you live a healthier, more comfortable life. Patients seeking chiropractic treatment at Reilly Chiropractic can be assured that the most modern, up-to-date techniques are being utilized to facilitate their overall health and wellness goals. We have helped people with neck pain, upper back pain, lower back pain, bulging discs, herniated disc pain, pinched nerve pain, headaches, ear aches, shoulder pain, elbow pain, knee pain, foot pain and more. Broghan J. Reilly, M.S, D.C. and staff look forward to providing you and your family with excellent service and natural health care through chiropractic treatment and therapy. 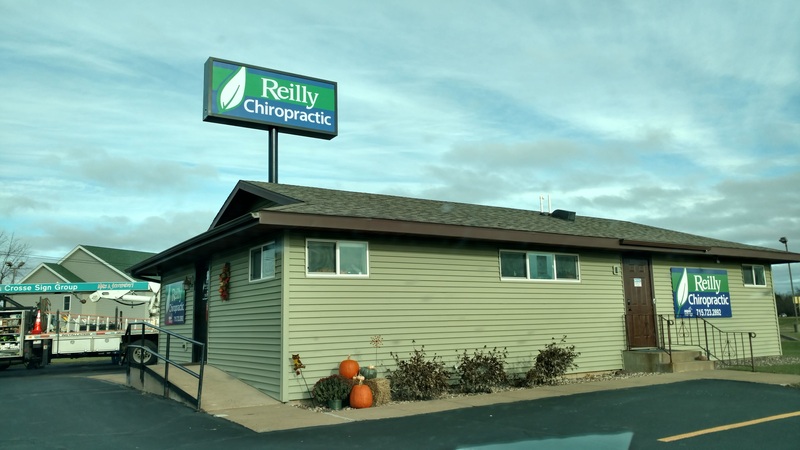 Reilly Chiropractic has been providing the community of Lake Hallie chiropractic care, serving the residents of Lake Hallie, Chippewa Falls, Eau Claire, Bloomer, Cadott, Elk Mound, Altoona, Seymour, Stanley, Boyd, Jim Falls, Cornell, Holcombe, Colfax, Chetek, Union, Lafayette, Lake Wissota, Crescent, Tilden and Eagle Point.